College Welcomed Nobel Laureate Eric Kandel to Speak on "Truth and Power"
The Farquhar College of Arts and Sciences Division of Math, Science, and Technology welcomed Eric Kandel, M.D., recipient of the 2000 Nobel Prize in Medicine or Physiology and university professor at Columbia University, to Nova Southeastern University on Thursday, February 21, 2008, in the Miniaci Performing Arts Center. Kandel spoke on "The Molecular Biology of Memory Storage and the Biological Basis of Individuality," as part of the college's Distinguished Speakers Series. In his lecture, Kandel drew from his groundbreaking studies on the basic molecular mechanisms underlying learning and memory in animals, ranging from snails to flies to mice and even in humans. His research has demonstrated that learning produces changes in behavior by modifying the strength of connections between nerve cells. It has also uncovered the biochemical changes that accompany memory formation, such as the functional modulation of the synapses in short-term memory and the activation of genes and synthesis of proteins to grow new synaptic connections as part of long-term memory. These studies have been central to understanding not only normal memory but also dementia and other mental illnesses that affect memory. In addition to his duties at Columbia University, Kandel is the Fred Kavli professor and director of the Kavli Institute for Brain Sciences and a senior investigator at the Howard Hughes Medical Institute. A graduate of Harvard College and N.Y.U. School of Medicine, Kandel trained in neurobiology at the National Institutes of Health (NIH) and in psychiatry at Harvard Medical School. He joined the faculty of the College of Physician and Surgeons at Columbia University in 1974, as the founding director of the Center for Neurobiology and Behavior. Born in Austria, Kandel fled with his family to the United States on the eve of World War II. However, the traumatic events endured under the oppressive Nazi regime have been forever seared in his memory. 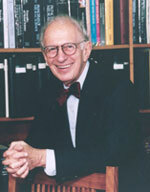 For more information about Eric Kandel, M.D., visit the Howard Hughes Medical Institute.